On 14 July 1958 the army of Iraq sized control of Baghdad and overthrew Iraq's monarchy. King Faisal II, second cousin of Jordan's King Hussein, was killed. Thirty-seven years of Hashemite family rule had ended. Iraq became a republic, with many looking forward to good luck with that. One of the coup leaders was Abd al- Karim Qasim, a nationalist and the product of a union between a Sunni of Arabic and Kurdish descent and a mother who was Kurdish and Shi'a. Qasim had been a bright student and a school teacher before joining the army. Soon after the coup, Qasim was chosen to be the head of government – the prime minister – and the minister of defense. Those doing the choosing were members of the Revolutionary Council, headed by a three-man sovereignty council composed of members of Iraq's three main communal/ethnic groups: Shi'a, Kurds, and Sunni. The tripartite group assumed the role of the presidency. The cabinet under the presidency was composed of a broad spectrum of Iraqi political movements, including two from non-Marxist National Democratic Party, one member of anti-colonialist al-Istiqlal independence party, one member of the Ba'ath party and one Marxist. On 26 July an Interim Constitution was adopted. A permanent constitution was to be created following a free referendum. The Interim Constitution listed the state religion as Islam. The constitution proclaimed equality under the law for all Iraqi citizens, freedom without regard to race, nationality, language or religion. Political prisoners were freed, including Kurds who had participated in 1943 to 1945 uprisings against the Iraqi state. Exiled Kurds were welcomed by the new Iraqi government. And Qasim lifted the ban that had been placed on Iraq's Communist Party. Qasim is said by his admirers to have worked to improve the position of ordinary people in Iraq. And Qasim did what Egypt's president, Nasser, had done: he moved to form alliances with communist countries. The Eisenhower administration was alarmed. So too were members of a small Ba'ath party, a party with perhaps less than 1,000 members at the time. Qasim came into conflict with the Ba'athists and the deputy prime minister, Arif, who were in sympathy will the intentions of President Nasser of Egypt to create a political unity of Egypt, Syria and Iraq – a United Arab Republic. One of Iraq's Ba'athists by the year 1959 was a 19-year-old Saddam Hussein. On the internet are descriptions of CIA contacts with Ba'athist members, including Saddam. The CIA was following the Eisenhower administration's Cold War concern about what it perceived to be the dangers of Communism. The Eisenhower administration has been described as wanting Qasim overthrown. Qasim had allied himself with the Communist Party, but rather than beholden to it he was containing its ambitions, to the extent of putting some Communists in prison. But for the Ba'athists Qasim's opposition to Nasser's United Arab Republic remained an issue, and in early October 1959 they moved against Qasim in a traditional way – assassination. One of the participants was Saddam Hussein. He is said to have messed-up the operation by firing his weapon too early. Qasim was wounded and survived. Saddam Hussein was shot in the leg and fled to Syria and then back to Egypt, where he had been a university student. In December, Qasim pushed for greater equality for women. He promoted a revision of the personal status code. Polygamy was outlawed and a minimum age for marriage established at eighteen. Women were to be protected from arbitrary divorce, and women were to be given equal protection concerning inheritances. These moves created more hostility toward Qasim. Hostility to Qasim was held also by the Anglo American-owned Iraq Petroleum Company. In September 1960, Qasim proposed that the company share 20 percent of its ownership and 55 percent of its profits with the Iraqi government. The company refused, and Qasim issued Public Law 80, which would have taken away 99.5 percent of the company's ownership and establish an Iraqi national oil company to oversee the export of Iraqi oil. Early in the presidency John F. Kennedy, British officials and multinational corporations were called on the Kennedy administration to do something about the Qasim regime, at a time when the Kennedy administration was involved in Cold War hostile acts regarding Cuba, Vietnam and elsewhere. The Kurds, meanwhile, had been quarreling with Qasim. By August 1961 they were demanding recognition of Kurdish autonomy. In response to an armed defiance among the Kurds, Qasim sanctioned a military campaign against them. Warring ensued that is said to have undermined Qasim's prestige among army officers. Qasim has been described as sharing his income with common people, as living in a simple apartment. He is also described as having moved to elevate himself to supreme leader and to have diminished the political freedoms of political opponents, a curtailing of democracy for the sake of control. But his control was lost. On 9 February 1963, army officers with ties to the Ba'ath Party moved forces against Qasim and his supporters and sympathizers, including Communists. A two-day battle ensued. Qasim was killed. Ba'athist leaders were appointed to the cabinet and the former deputy prime minister and still military general, Salam Arif, became president. The Kennedy administration has been accused of complicity in the coup. While CIA contacts with the Ba'athist in the attempted overthrow of 1959 has been admitted, complicity in the 1963 has been denied and described as a surprise to the people in the CIA. Described also is the slaughter of Iraqi communists. Being communist in Islamic countries could be unhealthful. At least 5,000 Iraqis were killed in the two days of fighting, and immediately following there were house-to-house searches for "communists." By November there was quarreling, and General Arif drove the Ba'athists from power. In 1964 a new constitution was proclaimed. In April 1966 Arif died in a helicopter crash, and his brother, another general, replaced him as Iraq's president. In July 1968 another coup by the Ba'ath party brought to power Ahmed Hassan Bakr. Thirty-one year-old Saddam Hussein was one of Bakr's distant relatives -- good luck for the ambitious Saddam. He took charge of Bakr's secret police. His job was to enforce Bakr's authoritarian rule. In November 1969 he became Bakr's vice president. In the early 1970s, Saddam became the power behind the presidency. The Ba'athists considered themselves socialists, and as vice president Saddam supervised modernization of Iraq's countryside, where most Iraqis lived. He mechanized agriculture and distributed land to farmers. Farm cooperatives were established, with profits distributed according to individual work. Expenditures for agriculture doubled between 1974 and 1975. With the increase in production and Saddam's reforms the living standard of rural people increased. Oil profits were invested in industrialization. 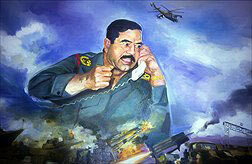 Saddam linked himself with his Ba'athist Party's economic and welfare programs, and his appeal among Iraqis increased. Although hardly a communist, Hussein's favorite reading had been about Josef Stalin. Using intimidation, Saddam moved closer to Stalin's style. Bakr's fear of his vice president grew, and he tried to get rid him. Instead, in 1979, Hussein pushed his relative, Bakr, aside and took power. In taking control, Hussein called a meeting attended by government and party officials. To secure his rule and as a warning, Hussein called out the names of the dozens of individuals. They were obliged to leave the hall and were escorted to their executions. These were prosperous times for Iraq, which was one of the world's big oil producers. And Hussein was popular among many of Iraq's common people in appreciation of their new prosperity.